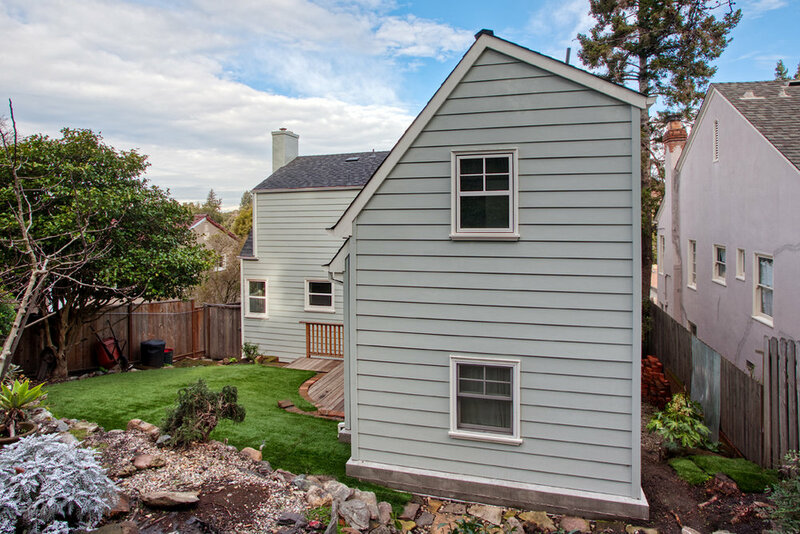 The owner’s purchased a two bedroom one bath Cape Cod style home originally built in the 1920's located in the Trestle Glen neighborhood of Oakland. The original house had the two bedrooms and only bathroom at the second level. 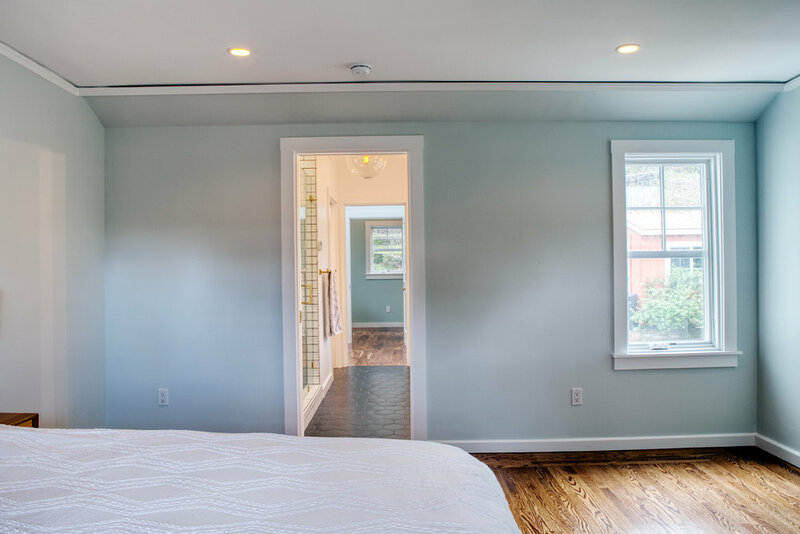 The owner's wanted to create a new bedroom suite for guests and their aging parents when they come to visit. Their desire was to make the guest bedroom suite more easily accessible for a wheelchair if necessary and have it located at the ground level. 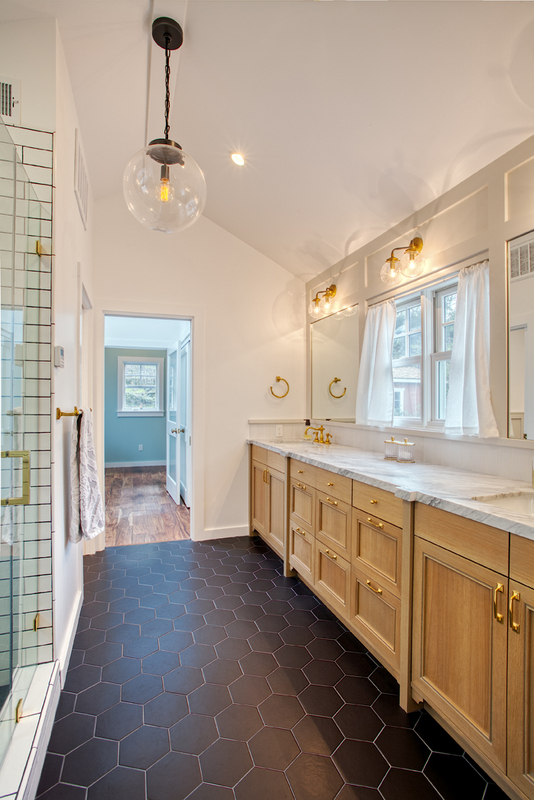 They also wanted to create new bathrooms for the larger house and to have an easily accessible bathroom from the main living area. Another concern was whether or not a kitchen remodel could be accomplished with the scope of the project and, if so, what it might look like. We developed a master plan showing various ways to create the extra space desired. One goal was to create a private space for the guests that was easily accessible. We looked at various options for adding the extra space including the possibility of adding a detached small dwelling unit in the rear yard. One result of that master plan study showed that a kitchen project would clearly take the project over budget. It was decided to put the kitchen project off to the future and simply focus on the added space needed for the extra bedroom and bathrooms. The owners ultimately decided to attached the addition at the existing living room. 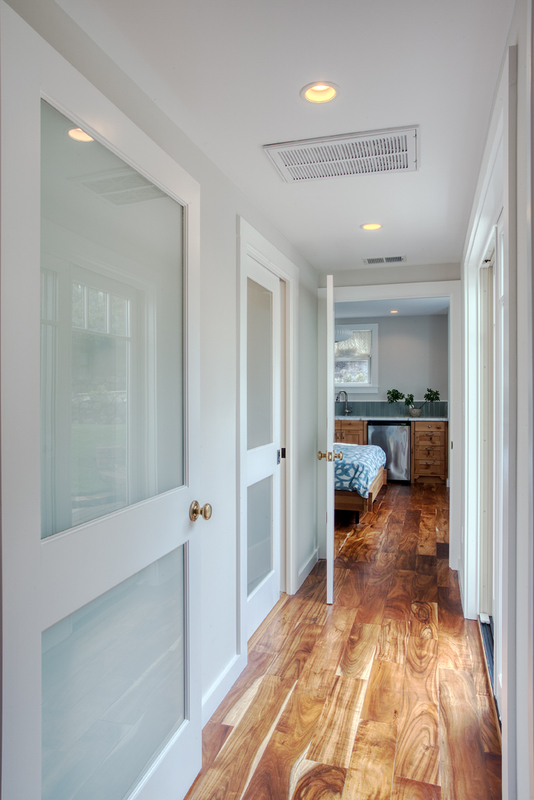 This afforded the opportunity to create a short hallway with access to a full bathroom and a nice sized bedroom at the ground level which would function as the guest room suite. It was then decided to make a second story over the lower floor. The second floor would contain a new master bathroom, walk in closet and study connected to the existing master bedroom at the second level. A 3d study was developed for the various one story and two story options for positioning the addition adjacent to the living room and master bedroom above. 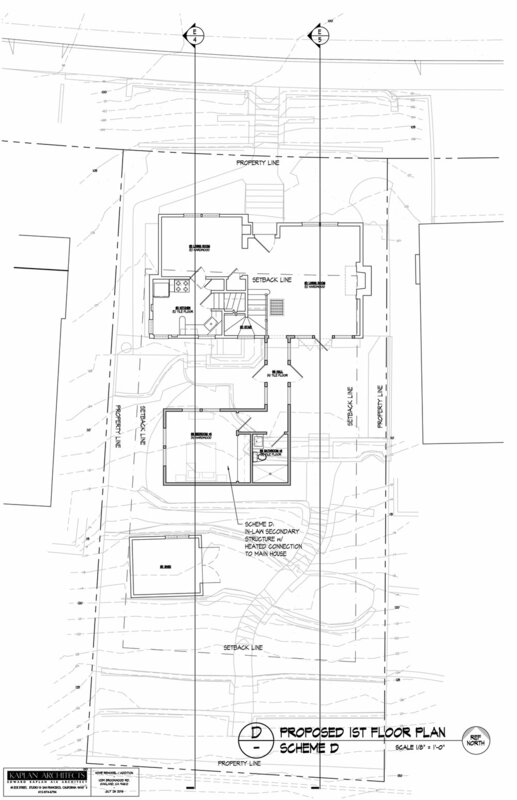 We submitted our plans to the local HOA and worked with an adjacent neighbor who had concerns about the height of the addition and affects on her access to sun. We explained to the HOA and the neighbor that we created the second floor level within an attic like space similar to the existing house second floor level. 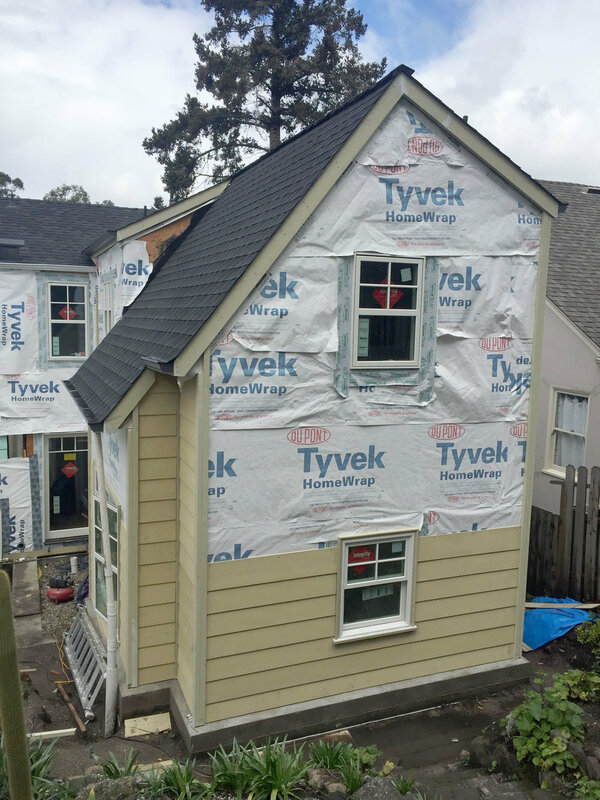 This was done to make the new addition tie into the existing house more seamlessly and also reduce the apparent bulk of the second floor level. Great effort was made to functionally and visually integrate the new addition to the existing house. The new addition is now complete and the flow of the spaces and integration of the addition look as if the addition was part of the original construction.